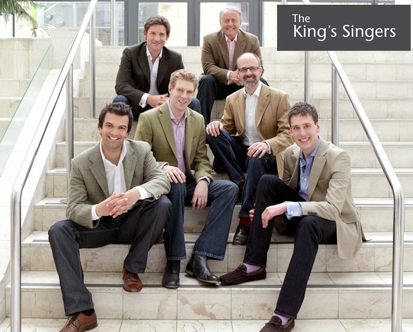 It seems incredible to me that I have now clicked up twenty years singing with The King’s Singers. The time has passed so quickly. I began my singing life forty years ago when I started as a chorister at Winchester Cathedral. At the age of fifteen I started using my falsetto in my school choir, and my fragile countertenor won me a choral scholarship to New College, Oxford, which I inhabited for three happy years from 1981 until 1984. Armed with a degree in geography I began my life as a freelance singer, specialising in higher falsetto parts with groups such as the Gabrieli Consort. The wonderful opportunity to audition with The King’s Singers came in 1989, and I joined the line-up in February 1990. When I get a moment I enjoy cooking, reading, sailing and doing sudokus; some of these things being more easily done on tour than others. I live with my wife, Sarah, in the beautiful county of West Sussex near the coast, and near my small sailing boat, which I occasionally get the chance to sail! My passion for singing carried on throughout my teens and in 2001 I began studying at Goldsmith’s College, part of the University of London. After this music degree, I was offered a Vocal Scholarship to study for a Postgraduate Diploma at Trinity College of Music, London. During this time I also became a Choral Scholar at the Royal Naval College Chapel in Greenwich, as well as singing services at places such as St. Paul’s and Rochester Cathedrals. This was a very important time for me vocally and I am forever indebted to my teacher, Timothy Travers-Brown, who worked so hard with me on technique and stage craft. In 2006, I auditioned for the prestigious position of Lay Clerk at St. George’s Chapel, Windsor Castle. Living in the Castle was wonderful, and after having been there for only 2 years, I was asked to audition for The King’s Singers job. Where has all the time gone? A question I ask myself on a regular basis, now looking back over my first year and a half as a King’s Singer. It seems like another life time ago that I was embarking on my first few concerts with the group in America, back in February 2009. The learning curve has been immensely steep but the sheer enjoyment in the variety that this unique job brings, and the joy that our music gives to people all over the world is, I’m sure, something that will never tire. I absolutely love the amount of travelling that being a King’s Singer entails, and although I find it simply impossible to stay awake on any mode of transport, I have still managed to see some pretty amazing views on our trips! Going to Asia this year stands out for me as being a highlight so far – I had never been before and the people, the food and the culture were simply fantastic. When we do find ourselves back in the UK, I love catching up with family and friends, attending the local discotheques (!) and exercising, getting myself fit and ready to go back on tour once again. It is often said that the older you get, the quicker the time seems to pass. It feels like a lifetime ago since I was a freelance tenor, learning so much about singing in different styles: from pop sessions, to singing arias in Handel’s ‘Messiah’, and even longer since I sang as a chorister in St. Paul’s Cathedral. Yet here I am thirteen years after joining what I think is the world’s finest vocal group, and I still enjoy every second of it. I feel lucky to stand alongside the most generous and skilled musicians, who have taught me so much and given me such pleasure. Highlights? Well, being awarded a Grammy in 2009 was a great honour, and performing in King’s College Chapel for the fortieth anniversary concert was an amazing experience. I continue to enjoy the travel, especially to new territories – China for example, where we have the chance to share our joy of singing with new audiences. I also love revisiting some of the world’s most interesting cities, concert halls, churches and airports! Back home in rural Cambridgeshire, I am enabled to continue in this job, by the wonderful Helena, who for much of the year brings up William,14, and Edward,10, single-handedly, saying that when I return home its like having three children to look after! We also now have a beautiful young ‘Border Collie’, named ‘Wiz’ who is a much-loved member of the family. 2011 will see me running my first marathon – cross-country, so as not to make it too easy! So I’ll be taking every opportunity to train whilst on tour, and constantly talking about it. When I’m not going on about keeping/staying fit, you’ll find me talking instead about cars. I bought my ‘ultimate’ car at the end of 2009, and feel free to ask me about it after any concert, if you have a few hours to spare! It doesn’t seem that long ago that I first stepped onto a stage with The King’s Singers, but now I find myself to be the oldest member. I first auditioned for the group in 1987, for the first baritone position being vacated by Tony Holt. Having failed to win that place I concluded that becoming a member of the group that I had idolised in my teens was not meant to be, but founder-member Simon Carrington called me in 1993 asking if I would like to audition for his own job as second baritone, and this time I was successful. An ironic twist occurred two years later when I volunteered to fill the once again vacant first baritone position, thus finally, and to my great personal satisfaction, securing the place which I had failed to win nearly ten years previously! Before joining the group I was Director of Music of a prep school in Salisbury and a Lay Clerk in the choir of Salisbury Cathedral, as well as being the pianist and arranger for a local dance band. Prior to that I had worked as a freelance singer in London, and when exchanging life in the capital for life in the Wiltshire countryside in 1982, vowed I would get a proper job and never again rely totally on singing! On tour I spend a good deal of my spare time arranging for the group and composing, which I absolutely love, and the rest sitting on aeroplanes and eating the wrong food at the wrong time, both of which I do not particularly love. During my time in the group I have visited a great many towns and cities, assisted my wife Lizzie in the bringing up of our three lovely daughters, and lost most of my hair (the last two things in this list might just be connected…). Writing at the start of our 2010-2011 season I’m about to be joined by another new colleague and can nearly count myself amongst the more experienced King’s Singers in the current line-up. It’s been an incredible career in the group so far, providing many musical highlights and a lot of new friends. I think you never really stop learning and growing as a performer so this next chapter will be full of different experiences – and as always the chance to welcome a new member, with new ideas and energy, is an incredibly exciting prospect! Going through the audition process for Stephen’s replacement reminded me once again how lucky I am to be touring and singing with this wonderful bunch of gentlemen. I never really thought I’d have a full-time professional singing career, especially not when in the middle of a complicated day at my former job, as a lawyer in London! Since I joined in 2004 I’ve sung at many dream venues, including Amsterdam’s Concertgebouw, New York’s Carnegie Hall and London’s Royal Albert Hall, to name but a few. Juggling work and home life can be difficult but I’m lucky to have a wonderful family to return to, including our first child, born in July 2009. As usual with new parents, when I’m home Stephanie and I spend most of our energy playing with Bella, and taking her to music or swimming classes. learning to manage my life from all kinds of public transport. I still find it arresting that it’s now my job to sing as part of the best male a cappella group in the world. I felt like I had so little control over the selection process: suddenly, one day while at work, I received a telephone call, asking me if I’d like to audition. Five months later, I was at the tailor, being asked for my King’s Singers suit measurements. As I imagine is the case with all dream jobs, you just turn up at interviews with no serious belief that you might be chosen. I distinctly remember smiling inanely throughout in a vain attempt to disguise my nerves. Hopefully, I’ll learn to relax my face so I don’t look manic on stage but, needless to say, I reckon it’ll take a while for my excitement at performing with the group to subside. It’s hard to know where I’m going fit in all the other things I used to do in my spare time. Part of me would love to preserve some of the (little) knowledge I accrued whilst reading Classics at New College. At the same time, I have social and aesthetic needs (I am only 23, after all,) that I’m sure will need satisfying first on rare days off and during longer vacations, whether I’m with parents in the South of France or housemates in London. I can already tell that it’s an imperative in this group to make the most of your time wherever you are and, frankly, that’s fine by me.